With Haarvisie hair extensions you’ll get the hair you’ve always dreamed of. Longer, more volume or with glamorous colours: nothing stands between you and your ultimate style. Do you dream of beautiful long and full hair, which creates the most special hairstyles? Now you can have that hair, with Haarvisie hair extensions. Surprise yourself and your environment with great hair dos and freely experiment with styles, colours and lengths. Celebrities like Lindsay Lohan, Miley Cyrus and Victoria Beckham have done it too and now you can experience the magic for yourself with Haarvisie hair extensions. Hair extensions are real hair that you combine with your own hair. So you simply create a long and voluminous hair style and bad hair days belong in the past. For special events, such as your wedding day or special celebration, hair extensions are ideal. The wildest hairstyles, you previously only dreamt of, are now just an appointment away for you. Make an appointment at our salon and in a few hours you undergo a complete transformation. Up Do, glamorous colours or even with Swarovski crystals with extensions you can make all your hair dreams come true. The first step of getting yourself some hair extensions is a free consultation. – What exactly do you want to achieve with your hair? – Are hair extensions the best way to achieve your goal? The answers to these questions are important for choosing the right hair extensions. Hair extensions come in various lengths, colours and compositions. The best choice depends on your budget, your needs and your daily use. Do you, for example, blow dry your hair on a regular basis or do you want to spend as little time as possible? And how many extensions are necessary to achieve your desired result? In this consultation, we also look at the shape of your head and the quality of your hair. 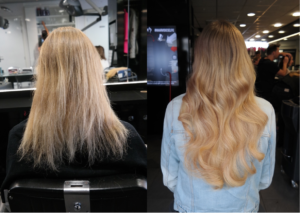 Hair Extensions are invisibly attached to your regular hair and it has to be strong enough.The stylists at Haarvisie have over 20 years’ experience and tell you exactly what is and is not possible with hair extensions. A free consultation is highly recommended if you have any questions. The second step in placing hair extensions is the determination of the correct colour. To match them with your own hair as naturally as possible, we often need to use multiple colours. We take enough time so we can determine the right colours together. If you are satisfied with the chosen colour, then we look at the desired length. Hair Extensions are available from 20 centimetres to almost a metre and the most important thing is that you are comfortable with the length. You choose what suits you and we advise you, based on our years of experience. Haarvisie works with hair extensions from the American brand Great Lengths. These are the inventors of the extensions and their products are of unsurpassed quality for over 20 years. After the joint establishment of the length and colour, we choose the extensions that best suit your face and your daily usage. Most of the extensions we have in stock, so you can compare them directly. Once you’ve chosen the right extensions we attach them to your own hair using sound waves. You feel nothing of this treatment and the result is a long and full head of hair. Hair Extensions are made of real hair, but they are not fed through your scalp. Therefore it is essential that you maintain them properly with the right quality products. That way they’ll last for months. The experts at Haarvisie will gladly advise you. After attaching the hair extensions you will get extensive tips and explanations about washing and brushing the strands and how to prevent tangles. Additionally, in the salon you can order the best care products that help you keep your hair extensions in top condition. 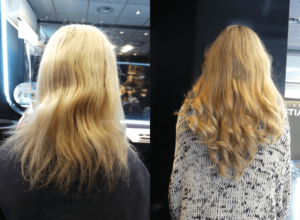 WHY CHOOSE HAARVISIE HAIR EXTENSIONS? – Will you get the beautiful hair you deserve?